The leaders of Sudan and South Sudan have held direct talks in the Ethiopian capital Addis Ababa aimed at resolving long-running disputes. Sudan’s President Omar al-Bashir and his South Sudan counterpart Salva Kiir met for almost two hours late on Sunday ahead of long-delayed talks. Differences over borders, oil revenues and the disputed region of Abyei took them to the brink of war in April. The UN has threatened sanctions if the latest talks do not produce a deal. 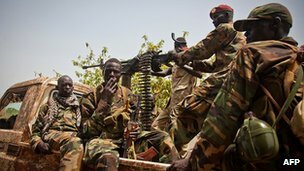 South Sudan seceded from Sudan last year following a long civil war in which two million people died – but serious disputes between the two countries remain. The BBC’s James Copnall in Addis Ababa said very little information had filtered out from Sunday night’s direct talks. Afterwards, the two men appeared together, smiling and looking relaxed. Mr Kiir told South Sudanese state media he hoped for a “celebration” after meeting Mr Bashir. Previously, spokesmen for both negotiating teams said substantial progress had been made on many of the issues. The main summit, which begins on Monday, is expected to bring together both presidents, a few key advisers, an African Union mediating team and Ethiopian Prime Minister Hailemariam Desalegn. The UN Security Council has called for urgent agreement on a demilitarised border zone – another issue hotly disputed by the two countries. Mr Ban called for “co-operation and mutual development”, and the US said Sudan should agree to an African Union border plan already accepted by South Sudan. Last month, the two countries agreed to re-open their land border after a closure lasting more than a year. However, the border remains unmarked. At independence in July 2011, the South gained two-thirds of the region’s oil while Sudan retained the processing and export facilities. In January, the South shut down oil production, accusing Sudan of stealing its oil, and the two countries’ economies have been damaged as a result. Negotiating teams said they had made progress on several of the outstanding issues before the heads of state arrived. The hope is that some degree of progress will encourage South Sudan to restart oil production, providing much needed revenue to both countries, our correspondent says. Foreign diplomats are cautiously optimistic and exerting gentle pressure on both sides, he adds.